The major scale is often called the MOTHER OF ALL SCALES, because all other scales, modes, intervals, chords and harmony in western music can be derived from it. It’s your main reference for all things making music. If you want to makes sense of what you are actually playing and learn to understand, analyze, create, and be able to play any chord, progression, solo, song or anything else that involves your guitar playing you need to know the major scale. It’s equally valuable for the rhythm guitar player and lead guitar player. The major scale is also a perfect warming up and dexterity exercise to start your guitar practice with. Two for the price of one. We all know the famous “Do, re, mi, fa, so, la, ti, do” melody you learned in preschool. This is the actually the major scale we are talking about here. And it’s important that you know what it sounds like, recognize it, and know how to sing it along. To form a major scale on a single string we use the Whole-Half step formula: “W-W-H-W-W-W-H”, where “W” = Whole step (2 frets) and “H” = Half step (1 fret). So going one fret up the neck is a half step, and going up two frets equals a whole step. You can construct a major scale on any note, and on any string using this formula. For example: Let’s start on a G-note (Low E-string/6th string, 3rd fret), now go up a whole step to an A (note), then up a whole step to B, up a half step to C, up a whole step to D, a whole step to E, a whole step to F# and finally up a half step to G. So the notes of the G major scale are: G A B C D E F# G ( 1 2 3 4 5 6 7 8/1). An open major scale means you are playing a major scale that also uses open strings. It’s the perfect scale for beginners, but also the intermediate player has to have this one memorized. See TABS below. Practice note: Learn to play your scales “in position” as mentioned above, where your fretting hand remains in a fixed location on the neck with each finger assigned to a specific fret. It feels uncomfortable at first but this way you are building dexterity in your fingers and eventually it will make your playing faster and more fluid. Start slow, and play your notes clean and clear. You can also play the G major scale as a “Movable major scale shape/pattern”, starting with the root note on the Low E/6th string). Moveable means you can move the scale pattern anywhere up and down the fretboard and apply it to any key. I’ll explain in a second. First practice the scale. If you move the entire G major scale shape up a whole step (2 frets), you are now playing an A major scale. (See below). You’ll notice the scale pattern remains the same, you only move it up. You can move the scale pattern anywhere on the fretboard. The root note (red coloured) of the scale always determines the name of the scale. If the root note is a G, you have a G major scale, if the root note is an A note, you have a A major scale. As you can see the major scale you just played is in fact a two-octave major scale pattern. You’re actually playing two major scale one after the other, only the second major scale is one octave higher. MOVABLE MAJOR SCALE SHAPE / PATTERN (Root note on A string) You can also play the major scale pattern with the root note starting on the A (5th string). In the example below we’re playing the scale pattern starting with the root note on the 3rd fret (C note) so we have a C major scale. Of course, you can move this major scale shape pattern also up and down the fretboard and play it in any key you like. Move up the entire C major scale pattern a whole step (2 frets) and you have a D major scale, move it up another whole step and you have an E major scale, and so on. Practice the single string scale on different strings and starting from different frets using the W-W-H-W-W-W-H scale formula. Listen to the sound of the scale and sing along each time. Practice the open G major scale and speak out the note names as you play the scale ascending and descending. Memorize the scale and the note names. Practice the Major scale shape pattern (root note Low E/6th string) thoroughly ascending and descending. Practice slow, clean and clear. Practice Major scale shape pattern (root note Low E/6th string) in different keys. Try the the following: key of G (3rd fret), A (5th fret), B (7th fret), C (8th fret), D (10th fret) and E (12th fret). Practice the Major scale shape pattern (root note A/5th string) thoroughly ascending and descending. Practice slow, clean and clear. Practice Major scale shape pattern (root note A/5th string) in different keys. Try the the following: key of C (3rd fret), D (5th fret), E (7th fret), F (8th fret), G (10th fret) and A (12th fret). 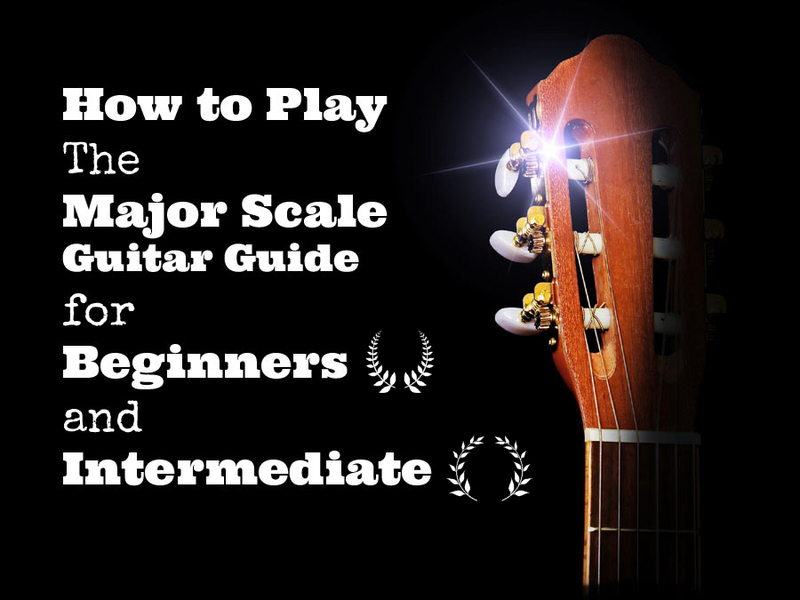 Check out some of the other links in this post to discover what the major scale can do for you and your guitar playing. Extensive and clear explanation of the major scale. Learned a lot. If you have any questions about the topic let me know.